Nearly 100 Auburn University faculty are gathering Oct. 23 for the 2018 Auburn Research Faculty Symposium in which they will discuss and display posters of their innovative research. 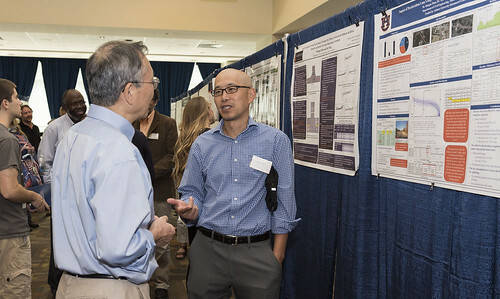 With projects ranging from cyber security to oyster farming to animal-assisted intervention for improved health, the annual event in the Student Center provides Auburn faculty an opportunity to share their discoveries university-wide and with the community. Two rounds of Auburn Talks are scheduled 8:30-10:30 a.m. in room 2222/2223 and 2:30-4:30 p.m. in the third-floor ballroom as 12 researchers, six per session, present 10-minute talks about their work. “The Auburn Talks are like the famous TED Talks as they provide insight into great projects,” said Steve Taylor, chair of the Auburn Research Faculty Symposium Committee and associate dean for research in the Samuel Ginn College of Engineering. The 8:30 a.m. session includes Bill Walton, College of Agriculture; Linda and O.C. Ferrell, Harbert College of Business; Wendy Troop-Gordon, College of Human Sciences; Angela Calderon and Jingjing Qian, Harrison School of Pharmacy; Wei Wang, College of Architecture, Design and Construction; and Frank Cilluffo, Ginn College of Engineering. The 2:30 p.m. session includes Jeff Katz, College of Liberal Arts; Haruka Wada, College of Sciences and Mathematics; Lisa Kensler, College of Education; Morgan Yordy, School of Nursing; Latif Kalin, School of Forestry and Wildlife Sciences; and Benson Akingbemi and Jennifer Panizzi, College of Veterinary Medicine. The titles for the talks are available at https://aub.ie/researchfacultysymposium. “The day will also feature a poster session and roundtable talks,” Taylor said. 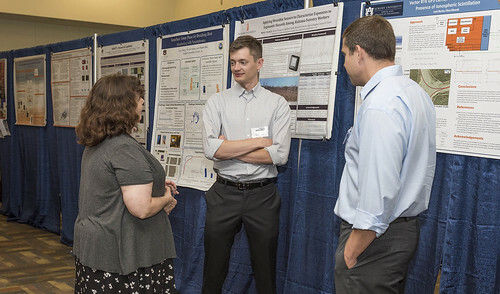 Research posters will fill the ballroom from 11:30 a.m.-1:30 p.m., including posters by all recipients of the recent Presidential Awards for Interdisciplinary Research. Two sessions of roundtable discussions are scheduled 10:45-11:30 a.m. and 1:30-2:15 p.m. with both sessions covering specific research topics as well as information to help researchers advance their programs. The 10:45 a.m. roundtable topics will include working together and talking to industry; virtual reality and augmented reality for advancing education and workforce development; protecting the nation’s infrastructure through interdisciplinary collaboration; space exploration opportunities; and connecting faculty expertise to regional economic development. The 1:30 p.m. topics include working with foundations; resources for faculty entrepreneurs; health research opportunities in the Department of Defense; food defense and security; and a discussion of how art and science do mix. In connection with the symposium, a Creative Scholarship Showcase was held earlier this month at the Jule Collins Smith Museum of Fine Art. The multidisciplinary exhibition featured fine art, applied art and design, performing arts, creative writing and other work from 22 departments across eight colleges. 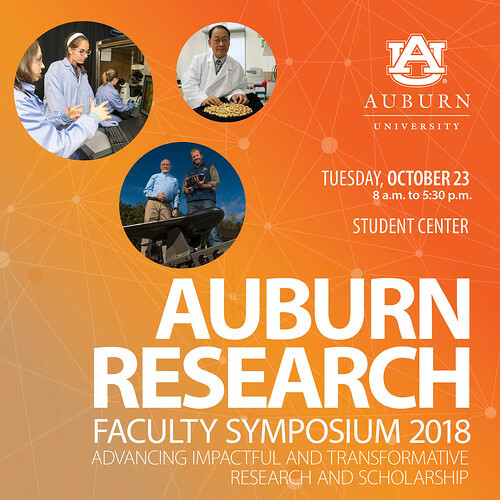 More information about the Auburn Research Faculty Symposium is available at https://aub.ie/researchfacultysymposium or by contacting Steve Taylor at taylost@auburn.edu. Nearly 100 faculty will present their innovative research Oct. 23 at the 2018 Auburn Research Faculty Symposium, with projects ranging from cyber security to oyster farming to animal-assisted intervention for improved health. Nearly 100 Auburn faculty will present their innovative research Oct. 23 at the 2018 Auburn Research Faculty Symposium. Pictured, Assistant Professor Mark Schall, center, of the Department of Industrial and Systems Engineering discusses his work at the 2017 symposium. Nearly 100 Auburn faculty will present their innovative research Oct. 23 at the 2018 Auburn Research Faculty Symposium. Pictured, Professor Huanyi Zhou, right, of the Department of Civil Engineering discusses his work at the 2017 symposium.